During the spring I reached out again to my aunt, the same one that recommended a developmental pediatrician the previous year. We talked again about the Brain Treatment Center, a place she had visited the previous fall that is offers MRT (Magnetic Resonance Therapy) using TMS (Transcranial Magnetic Stimulation) treatments for a variety of neurological issues including depression, PTSD and autism. She’s met with CEO and lead doctor, and has connections given her role at her hospital. We decide that we want to learn more so we set up a conference call. The call takes place at the end of April and the CEO explains the process of placing the coil, what they call the device that is held up against the forehead to provide stimulation. The science behind the therapy states that they provide stimulation in the frontal cortex in order for the front of the brain to “talk” to the back of the brain. In many children with autism the messages can get lost in the middle and never make it to where they need to go, thus developmental delays present. It has been reported that they have been able to see tremendous progress in children, including his own child, who is now speaking so much that they can’t get him to stop. This is a dream to us. They explain that the treatment has to be done in California and could take several weeks. I’m definitely thinking that this is completely out of the realm of possibility. Then the CEO offers to have us come to California for a month of free treatment… free. The call ends and I look at Ike dumbfounded. Without much hesitation he indicates that he would be willing to take time off from work to take him. The day after that fateful conference call, Mark has an interview for the Early Achievements program through CARD at Kennedy Krieger. We are so excited about this opportunity and incredibly grateful that we were hearing from them after only four months on the waitlist. We meet with his speech therapist who would be running the group and we love her right away! We’re given paperwork and informally told that Mark was in! We seriously consider shelving the trip for next year after we’ve given the Early Achievements program a chance to work but then I emailed Dr. Jin, the creator of this intervention and he explains that the younger the brain, the quicker the treatment may work, meaning a month of treatment may be all we need, whereas other children have needed three months or more. At home we think. And pray, and think some more. But the clock is ticking. In order for us to take advantage of this opportunity we must go in the beginning of May. The day after the call, my other aunt (first aunt’s sister) calls and offers my uncle’s assistance. He would be willing to fly out to California with us to show us around since my aunt and uncle had lived in the Irvine area for eleven years. We’re tearful and speechless. One of the most incredible things about this journey has been watching the characters in our story come along to help us completely selflessly. We are incredibly humbled and now motivated to seriously consider this. The month of May arrives and we celebrate Mark’s second birthday. Around this time I decide to send a copy of Mark’s EEG to one of the scientists at The Brain Treatment Center in California. They are supposed to be able to see if Mark is a good candidate based on an EEG. He emails me back and tells me that nothing obvious on the EEG, like seizure activity, is present and nothing would exclude him from trying the MRT. He also notes that Mark has posterior activity but it doesn’t propagate forward, which he believes correlates with developmental delay. He also theorized that the MRT could encourage more global function. Ike talks to his incredibly supportive boss about missing work for an undetermined amount of time. They could go for a week and determine that it wouldn’t be beneficial or they could be gone for an entire month, or possibly more. His boss gives him the freedom to go and so we decide to embark on this leg of our journey. On Mother’s Day 2015, I had to say goodbye to my sweet boy and dear husband at the airport so that they could endure the six hour flight to Los Angeles, where my uncle would be waiting to meet them. Ike struggled with him through security as my parents and I watched helplessly on the other side, I felt incredibly anxious and nervous for the flight, the trip, the treatment, all the parts that I wouldn’t be there to witness. I felt empty and nervous that we made the wrong decision. 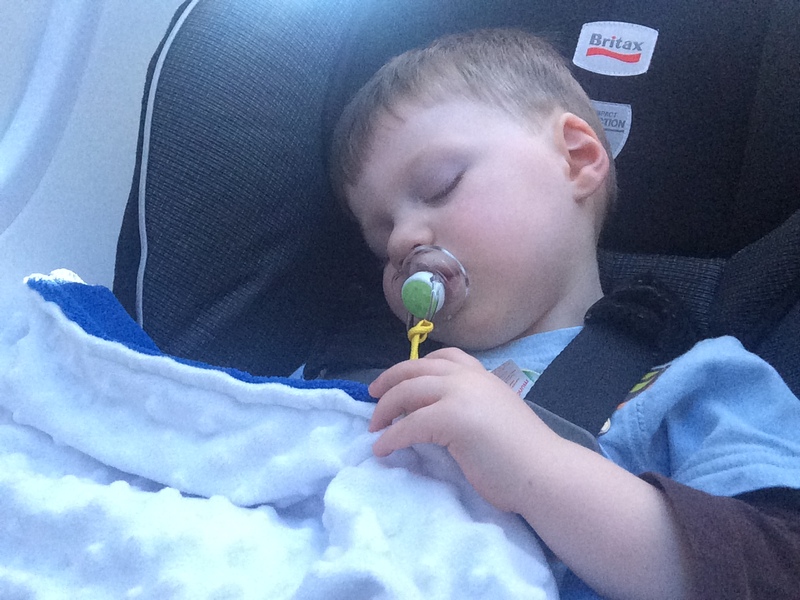 Aside from the difficulty of getting to the terminal and then wedged into the plane with the toddler car seat, their flight was uneventful and Ike felt God’s presence as he watched Mark in awe that he wasn’t crying through any of the travel. Ike could feel the prayers of so many of our friends and families as he embarked on a journey that would take them farther than he had ever traveled. Perfect passenger, slept almost the entire time. The weighted blanket that my mom made for him worked like magic! Throughout the trip we sent a mass email to all those that were praying for us. Below are the emails detailing our progress and experience with the Brain Treatment Center. Though this is quite lengthy, I know that if I was a mama wanting to learn about the treatment and experience, I would have appreciated the details. Many of you have reached out to us to let us know that you are praying and we wanted you to know that God is answering those prayers. We appreciate everyone’s texts, calls, emails, prayers, love and hugs. (Ike even texted one of my friends at work to give me a big hug today because I’ve been feeling a little down about the whole thing) What a blessing! First off I am happy to report that the journey here was flawless. 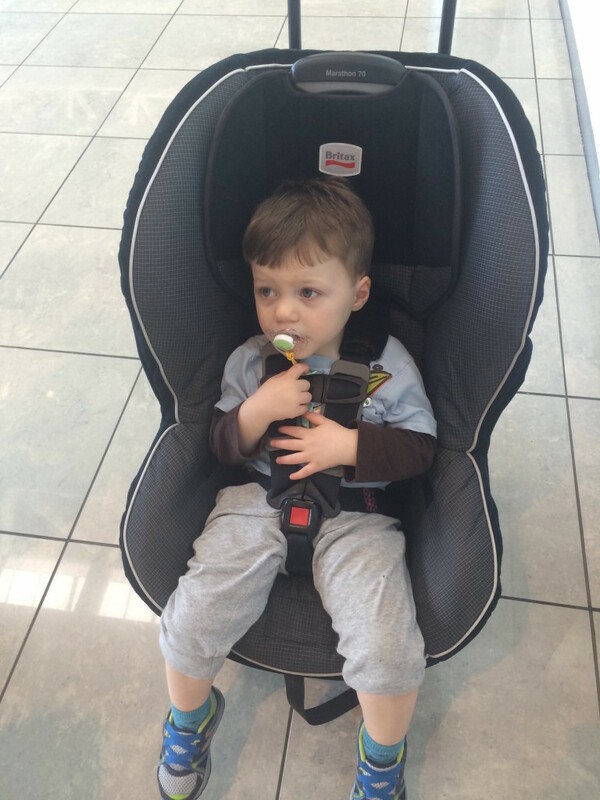 There were challenges along the way, getting through security, getting on an off the plane and the fact that Mark was essentially strapped in his car seat for a little over 10 hours. However, he never once got upset. He took it all in stride as if he had flown 100 times before. I could really feel the Lord with us during this time and it was a little emotional as I knew how many people were praying for us. It was a good reminder for me of the incredible power of prayer. Monday morning we had our introduction and initial EEG at the Brain Treatment Center. Mark had an overnight EEG at Johns Hopkins a few months ago and he did well. Not so much this time as this EEG was done while he was awake. He kicked and screamed the whole time until I finally had the idea to give him a bottle. This is not optimal because of the jaw movement but it was the best we could do. Later on that afternoon we reviewed the results. I was relieved to hear that they obtained some usable data. According to Marks EEG results his brain is at a place of rest pretty much all the time. They also described alpha activity and delta activity. Mark has no alpha activity at all. A typical child his age should have some alpha activity. That said, their goal for this week is to try to stimulate the brain and to create some alpha activity. 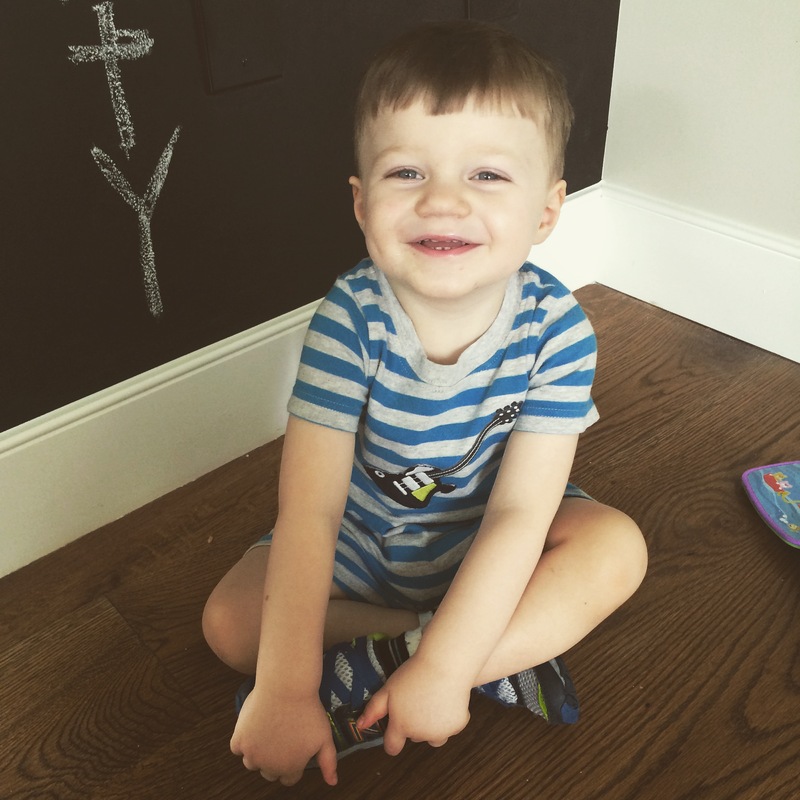 After this EEG review he had his first treatment. This involves holding the magnetic resonance device up to his head for 6 seconds and then away for 54 seconds, repeating this cycle for 30 minutes. The worst part is that they want his eyes closed. Since he is not capable of understanding direction, I have to close his eyes with my hand which he does not like. He fusses about it, but it’s not too bad as 6 seconds is over pretty quickly. We had our second treatment on Tuesday morning and it was basically the same thing. We have another treatment Wednesday, Thursday and Friday, followed by another EEG and another review where we will be able to see if they achieved anything this week.That said we will not really know any more until Friday afternoon. In the down time, Uncle Rick is doing his best to show us around Southern California a little bit. For example, we just got back from an Anaheim Angels baseball game. If you could please continue to pray for us, for Gods ‘will in all of this and in particular for the EEG scheduled for Friday, that it would go better than the first one. Also, of course, for the results to be positive and encouraging. Thank you all for your continued love, prayer and support. It is very humbling. I wanted to send another update since Mark has completed his first week of treatment and had a subsequent EEG to track any change. Once again I’m passing along Ike’s update but I wanted to share some more of my praises from last week. *Mark’s EEG went so much better than the first one on Monday, he was relaxed and calm, and they were able to get good readings. *Mark’s spinning has significantly decreased to almost never since they’ve arrived in California. We’re not sure if it’s due to the treatment or the lack of access to open hardwood floors… but we’re thankful none the less. *Paige has been staying with me each night and that has been a huge blessing in many ways. *We have loving family members who were able to watch Jilli last week when I had odd work hours and had to work on Saturday for HCCs graduation. Not to mention the countless family and friends who have checked on me and offered help with anything we should need while Ike is away. Though this journey has been challenging, in more ways than one, we are comforted knowing that we are not walking alone and we have the love and support of all of you! Once again I would like to thank you all for your prayers, love and support. This morning Mark had his second EEG after a week of treatment and this afternoon we reviewed those results with one of the doctors at the BTC. Unfortunately the EEG showed no notable difference from the first one that was taken before any treatment was administered. This is obviously disappointing, however, it is not surprising as I can say I have not seen any notable changes in Mark’s behaviors either. The doctors recommendation is to try another week of treatment and see if anything changes. At this point they are still doing the treatment pro bono and we are already here, so we have decided to do just that. Originally we were only told about delta and alpha waves. The doctor today also mentioned theta waves. Apparently it is not uncommon for children under the age of three to not have alpha waves. However they should have theta waves and Mark does not. Delta waves are between 4 to 8 hertz, theta waves are between 9 to 13 hertz and alpha waves are between 14 to 18 hertz. Marks brain tends to be right around 6 hertz all the time. Please continue to keep us in your prayers as we continue this journey. We are comfortable with the fact that while we do everything we can to help our little guy, in the end the outcome is in Gods hands. Any progress or development will be a gift from Him. Ike & Mark are safe and sound, back from California! We are so thankful for their trip and are over joyed that they are home. Here’s Ike’s message regarding the trip. We had another EEG Friday morning the 22nd. We then reviewed all of the results from the previous two weeks on Friday afternoon. According the the EEG results, Marks brain was responding to the treatment, however, the response was very slow and inconsistent. After talking with the staff at the Brain Treatment Center, it was determined that the treatment may be more effective for Mark in a year or two after his brain has had more time to develop and mature on its own. We feel at peace about the whole thing and we do not feel like it was a wasted trip. First of all, we have seen minor encouraging things in Mark’s behavior. Perhaps it’s a result of the treatment, perhaps it’s a coincidence. Second of all, we have a greater understanding of the treatment itself and the science behind it. Third, we met a lot of wonderful people, some of whom were also parents of autistic children who were there for the same reason we were. I have to admit I was a little skeptical about the treatment, mainly just because it seems to good to be true. However, after meeting some of these other parents who have seen their children transformed in a matter of months, I do believe the treatment is legitimate and is producing great results in many of the kids they treat. That said, we we are willing to consider trying it again in a year or two if we can find a way to swing it. I completely echo his sentiment, despite the lack of significant change on the EEG, we are thankful he was a responder to the treatment, we are at peace about the trip and are thankful for the opportunity to go and learn more about the process. We look forward to being able to return in the future for more treatments, and pray that we are able to make it happen. Once again, we are very thankful for the great deal of support we have received from all of you in form of prayers, phone calls/emails/texts, helping with Jilli’s care, mowing our lawn, inviting us over for dinner, and the biggest sacrifice that my uncle made in flying out to be a source of support to Ike and Mark while in California, we will forever be grateful. This summer holds many more opportunities for new intervention and therapy for Mark. Next week I will be taking him to a short term/parent training Occupational Therapy program at Kennedy Krieger called “Play With Me”, which we will do every Monday morning for five weeks. We then meet with an integrative medicine developmental pediatrician at the end of the month to pursue further lab testing and get more help with his diet, possible supplements and other potential therapies. Then in July he will start a program through Kennedy Krieger called “Early Achievements”, this programs meets M-Th and involves a small group of children with autism (4-5) with one speech therapist, and two assistants. It will run like a pre school program but include intensive speech therapy, along with ABA, OT and floor time activities. We are so grateful that he was chosen and look forward to this new adventure, which involves driving him to Odenton, MD (about 1 hour, 15 minutes away) four days per week. Transportation and insurance coverage have proved to be quite challenging, but God has provided and it seems as though my persistence may be paying off. We haven’t decided for sure, but we may also take him down to Florida in August for a one week intensive course of Cranio Sacral therapy which has been suggested by a friend, who utilized it with her son with ASD with great results. As always, thank you for praying for and with us.